Do you think that China is close to facing a revolution? 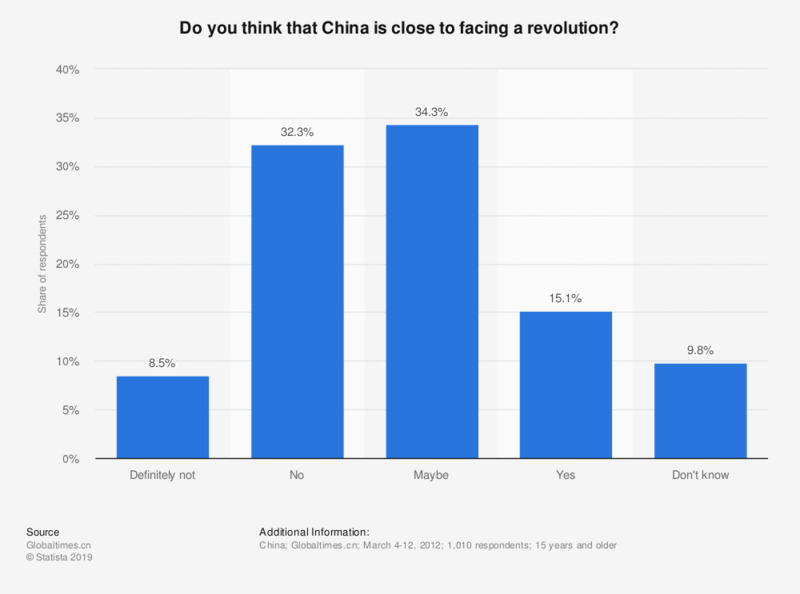 This statistic shows the results of a survey on a possible revolution in the near future in China in 2012. In 2012, 8.5 percent of respondents do not think that there will be a revolution any time soon. Are UK political parties good at explaining the implementation of their policies? What in your opinion is the main drive of reform? Are you of the opinion that stakeholder groups present a main obstacle to reform? Do you agree or disagree with the statement that the rich should be taxed more to support the poor? Would you support the closer monitoring of faith schools to help the successful integration of Muslim communities into wider British society? To what extent do you agree or disagree that the political parties in the United Kingdom (UK) are good at explaining how their proposed policies will be implemented?